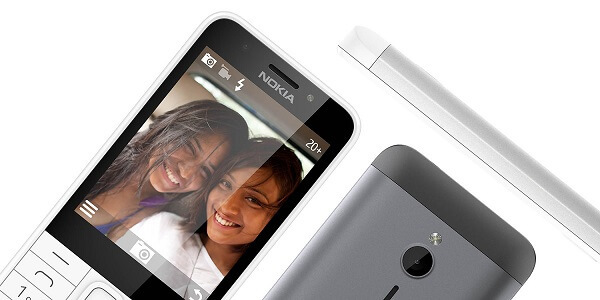 Microsoft today announced the new Nokia 230 and Nokia 230 Dual SIM feature phones. The 2.8 inch screen is ideal for taking and showing off pictures, playing games, and streaming video. Both devices are beautifully crafted and ready for selfies with a 2 MP front-facing camera and an LED flash and a sand-blasted aluminum back cover that wraps tightly around the sides of the phone. Also, you can download one free Gameloft game which includes “Assassin’s Creed Brotherhood” and “Midnight Pool 3.” every month for a year. Find useful info and your favorite sites quickly with the Opera Mini browser, Bing Search, and MSN Weather. These devices will be available around the world starting in December in India, Asia, and the Middle East. Other markets will follow in 2016.